Moroheiya, also known as mulukhiya, has been cultivated in Egypt since ancient times. Its fibers are spun into jute while its young shoots and leaves are harvested as a vegetable and used in traditional Egyptian dishes and stews. The taste is mild and similar to spinach, while the consistency is sticky like okra. It can be used in salads, soups, or juices. When added to soup, it makes a thick, gumbo-like dish. Japanese style is to parboil it (20 seconds to 1 minute), chop it finely, and serve it on rice or noodles with soy sauce, ponzu, mentsuyu, wasabi, etc. Moroheiya can also be enjoyed raw or in juices. Moroheiya contains great amounts of vitamins, minerals and dietary fibers in quantities that surpass most known vegetables and herbs; it is a great way to eat healthily when other greens may be out of season. (1) Chop the moroheiya leaves as finely as possible. (2) Over high heat, bring the chicken stock to a near boil in a large pot. Add the moroheiya, and black pepper, stirring well. Reduce heat and simmer. The moroheiya will simmer for 20 minutes. (3) After the chicken stock and moroheiya have simmered for about ten minutes: heat the butter in a skillet. Grind the garlic, ground coriander, and the salt together into a paste. Fry the mixture in the oil for two to four minutes, stirring constantly, until the garlic is slightly browned. (4) After the moroheiya has been simmering for about twenty minutes and has broken down to make a thick soup, add the garlic mixture and the butter it was fried in to the simmering molokhia. Stir well. (5) Continue simmering and stirring occasionally for a few more minutes. Serve immediately, hot. Moroheiya soup is often served over boiled rice and sometimes with boiled chicken. (1) Chop onion finely and boil quickly, just until the color starts to change. (2) Remove onion from water; add moroheiya leaves and boil about 20 seconds. 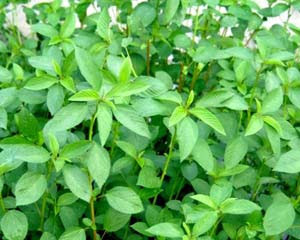 (3) Remove moroheiya, drop in cold water, then squeeze out excess water. (4) Cut moroheiya into strips, or chop. (5) Cut tomato into medium-sized pieces. (6) Mix moroheiya & tomato in a bowl until it starts to get sticky. (7) Add remaining ingredients and mix; adjust seasoning to taste. (8) Can be eaten as is or chilled first. (1) Parboil moroheiya and chop into thin strips. (2) Cut the cooked chicken into bite-sized pieces. (3) Mix moroheiya, chicken, and ponzu.